As the most popular search engine in the world, many brands and businesses would welcome the chance to be closer to Google. A future where some websites can be registered by the search giant may be closer than many would have thought. Google has started a beta test where they will begin registering websites. Free Private Registration – No additional cost to hide the contact information in the domain registry. Branded Emails – Google will be able to create up to 100 email aliases for a domain that can be forwarded to existing email accounts like Gmail. Google already offers a similar to service for businesses that want branded emails, but it’s good to know that it will work on the newly registered domains. DNS Lookup Through Google – Sites that have their domain managed through Google will use the Google DNS servers to quickly and reliably connect users to the website. Each domain registered through Google Domains will get 10 million resolutions per year. 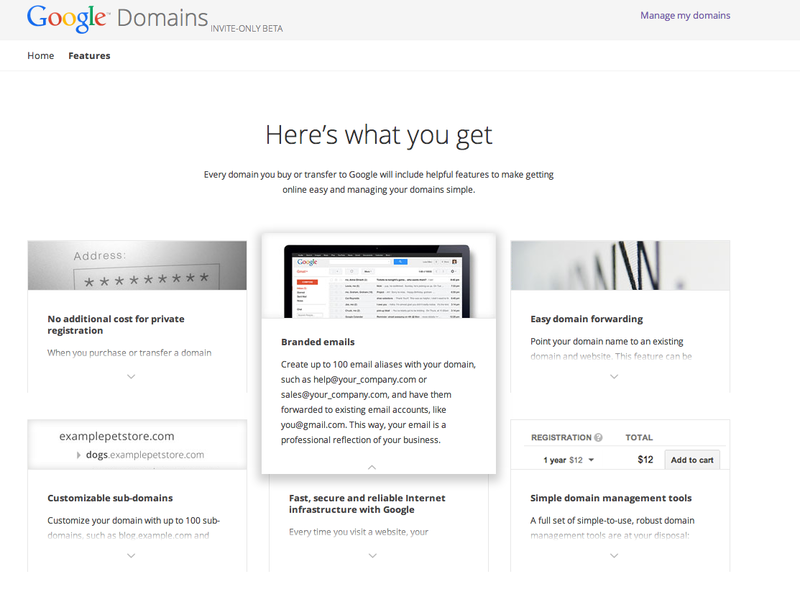 Basic Domain Management Tools – Sites using Google Domains will have access to tools for resource records, domain forwarding, customizable sub-domains, and more. Google will also be partnering with website building services like Wix, Squarespace, and others to provide easy-to-use tools for small business owners who need sites that look good but aren’t overly complex. People who choose Google domain registration won’t be limited to sites built with these services. Business owners would be able to use more complex sites they’ve had built by other designers. Besides the stated benefits, there would probably be an SEO benefit to having a site hosted by Google. Though Google wouldn’t be able to give the sites they host a boost in rankings (without facing massive anti-trust lawsuits), it stands to reason that the sites would be optimized for Google algorithm in ways that other sites might miss. For example, all the sites hosted by Google could be using SEO best practices before it’s explicitly stated that the algorithm is searching for something. It will take time before it is known if Google-hosted sites have an SEO benefit or how large such a benefit would be. Google’s entry into domain registration comes at an interesting intersection for the internet. New top level domains have been rolling out this year. Some believe that new domains like .dogs or .photography will lead to a new land rush of website registration and development. These new TLDs will be owned and administered by various different companies, unlike the current TLDs (e.g. .com, .gov, .edu) which are assigned and controlled by ICANN. If Google can position itself as a one-stop shop for registering any of the new TLDs or ensure that sites with new TLDs get good SEO positioning, domain registration could become a valuable revenue stream for Google. As with all things the company does, Google’s entry into domain registration will shake things up, if only because there’s a new kid on the block. To learn about some of the other big things Google is planning, read this article about Google’s plan to rebrand it’s local listings as Google My Business.